The River Glenderamackin follows a most unusual route, wrapping itself around Blencathra, Scales Fell and Souther Fell, flows east along their northern sides, and west along their southern slopes. The two halves of the river reach within a mile of each other between Scales Fell and Souther Fell, but they have a very different character. The upper reaches of the river flow through steep sides isolated valleys in the Skiddaw range, while the lower reaches flow through the gentle countryside on the approaches to Keswick from the east. The River Glenderamackin rises on the northern slopes of Blencathra, close to Scales Tarn. The Glenderamackin flows south-east for a short distance from its source, then turns to the north-east and emerges from the mountains at Mungrisdale. It then turns sharply to the south and runs down the eastern side of Souther Fell, which is thus surrounded by the river on three sides. 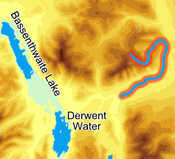 Having passed Souther Fell the river then turns west, and flows along the southern side of Blencathra. Just to the south west of Threlkeld the Glenderamackin merges with St. John's Beck to form the River Greta.